At least some firefighters and paramedics in communities in Massachusetts carry Narcan. If someone suffers a heart attack in public, bystanders can grab an automated external defibrillator, or AED, if one is stationed nearby, and administer shocks to help reduce the risk of death until paramedics arrive. Cambridge city officials don’t see why the same can’t be done in the event of an opioid overdose, using life-saving medicine. With the state and much of the country in the grips of a devastating opioid epidemic, Cambridge officials say they’re intrigued by a new proposal that could make the drug naloxone, which reverses overdoses, readily available to the public. The plan would involve placing lockboxes stocked with naloxone in parts of the city where drug use might occur. If passersby were to stumble upon someone who had overdosed, they could dial 911, get an access code to the box, and then follow instructions on how to administer the opioid blocker. The concept is still in development, so it’s too early to say if Cambridge will adopt the plan. But police got to see a prototype of the lockbox, created by the Boston startup GEMs, in action recently. 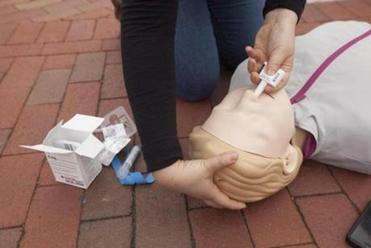 On April 28, as part of a study, Dr. Scott Goldberg, director of emergency medical services at Brigham & Women’s Hospital, and representatives of GEMs placed a mannequin on the sidewalk in Central Square and challenged passersby to intervene as though it were an opioid overdose victim. The demonstration was a collaborative effort involving a number of agencies committed to fighting the opioid epidemic. The goal was to find out if people would jump into action to retrieve the naloxone from a lockbox, and use it correctly, if it was a matter of life or death. Specialists in addiction reacted with enthusiasm when they heard about the proposal, which was first reported by The New York Times. They welcomed it as another potential tool to use against the state’s opioid crisis, which claimed nearly 2,000 lives last year. Herbert said that many people are trained to use naloxone but may not always carry it with them. Having the drug available in public places makes sense, she said. If the lockbox project gets off the ground, it would add a new approach to a decade of efforts in Massachusetts to make naloxone widely available. A dummy used to simulate treatment for overdoses. A state Department of Public Health program that started in 2007 offers instruction in recognizing and responding to opioid overdoses. 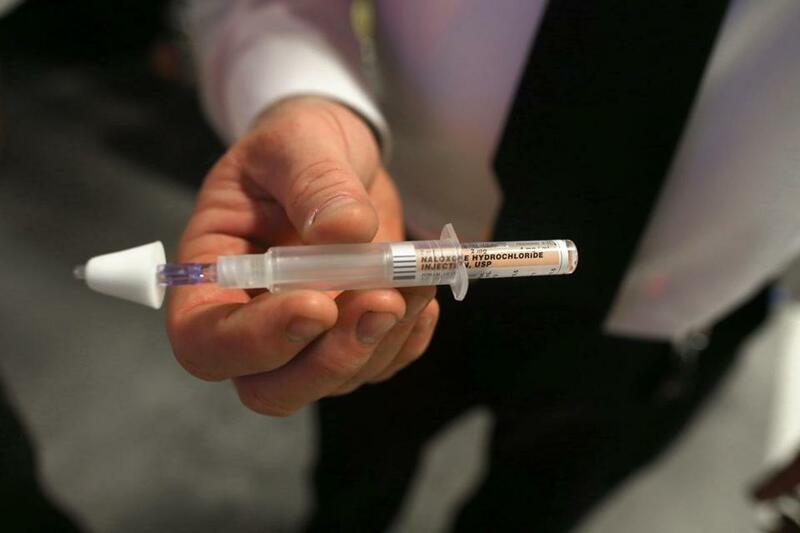 State grants have helped police and fire departments in 32 municipalities purchase naloxone. Since 2014, people who are at risk of overdosing, or know someone who is, can obtain naloxone kits at some 1,200 pharmacies without a prescription. The Boston Public Health Commission trains more than 10,000 civilians a year to use naloxone, and health officials reach out to businesses in areas with high opioid use to offer training and naloxone kits, said Devin Larkin, director of the Bureau of Recovery Services at the commission. Goldberg said that during the demonstration in Cambridge, which involved about 50 people, some were hesitant at first. “Some of the feedback before people actually started doing this was, ‘I don’t have medical training, and this isn’t something I am going to be able to do,’ ” he said. But Mark Kennard, director of community services at Bridgewell, a Lynn addiction treatment provider, said some people wrongly believe naloxone encourages drug use. Kennard said that notion has been proven false. Steve Annear can be reached at steve.annear@globe.com. Follow him on Twitter @steveannear. Felice J. Freyer can be reached at felice.freyer@globe.com. Follow her on Twitter @felicejfreyer.